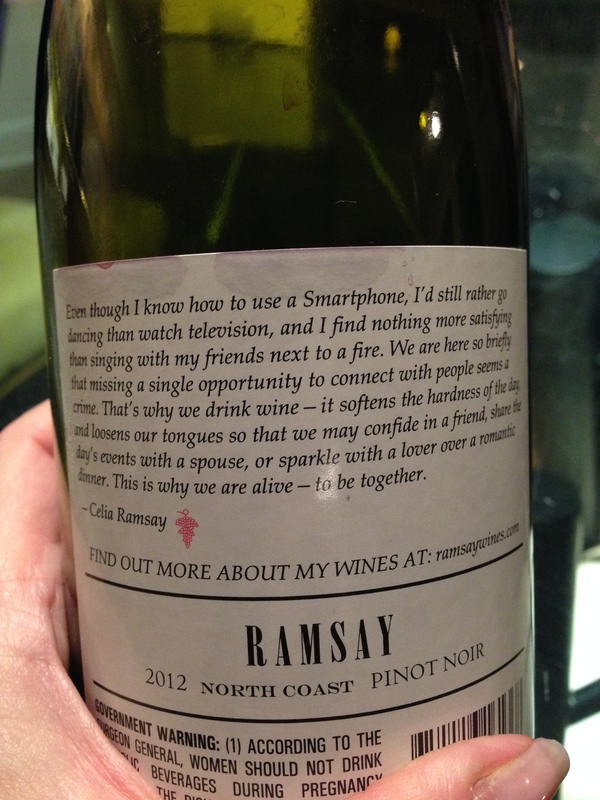 Friday night could not come fast enough this week, and with it came a lovely bottle of Ramsay Pinot Noir. This bottle was quite delicious. I highly recommend it. Even though I know how to use a Smartphone, I’d still rather go dancing than watch television, and I find nothing more satisfying than singing with my friends next to a fire. We are here so briefly that missing a single opportunity to connect with people seems a crime. That’s why we drink wine – it softens the hardness of the day and loosens our tongues so that we may confide in a friend, share the day’s events with a spouse, or sparkle with a lover over a romantic dinner. That is why we are alive – to be together. Thanks Ramsay… great way to end the week!